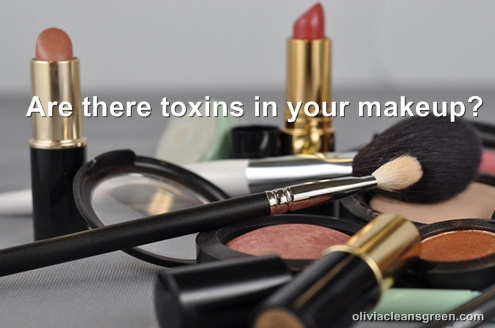 Olivia Cleans Green: What's Your Makeup Hiding? I just read a great article: Why Your Makeup is More Harmful Than You Think. Honestly, I never think about makeup because I don't wear any. However, it's not all about me so I'm taking a moment to share with you beautiful readers three ugly facts about makeup that the article pointed out. Out of 1,000 carcinogens the EU has banned, the US has only banned 9 of them. Scientists have only "improved" upon all of the chemicals used in our beauty products, making the particles both smaller and stronger. This means they're more easily absorbed into the skin and past the protective layers that once served as a barrier to these toxins. Terms like "herbal," "organic" and "natural" on beauty packaging aren't regulated and have no actual meaning. Trust us, there's not one "herb" in Herbal Essences shampoo. Go to safecosmetics.org or ewg.com/skindeep to suss out which exact products are chemical-free. Read the rest of the article on Wellness Today. Before you get all emo and worry you'll have to expose the world to your raw, unedited beauty (which I'm rooting for), know that you can totally make your own natural makeup. Amy at A Blossoming Life shares homemade natural makeup tutorials for mascara, foundation powder, blush, and bronzer. Katie at Wellness Mama blogged a bunch of natural makeup options, including eyeliner, and has another blog post on how to make natural tinted lip balm. I haven't tried any of their recipes, but the safe ingredients make me happy. Do you seek out natural makeup? Have you ever made your own makeup?